The Tassimo Hot Beverage System (average price $170) makes good on a promise to make “a perfect cup every time.” The machine is good looking machine that is as user-friendly as it is stylish. It is also incredibly versatile as it allows users to choose from 13 different hot beverage brands. The machine uses packages called T-Discs which allow for the creation of coffees, cappuccinos, espressos, real milk lattes, hot chocolate, and even teas. Once the T-Disc is inserted into the machine, a simple push of two buttons will allow the user to brew a cup at just the right drink strength. The machine handles the rest of the process. Using patented bar code technology, Tassimo’s system will adjust itself to ensure the right amount of water is chosen as well as the brewing time (approximately one minute) and the temperature for the beverage you have chosen to create. Tassimo also has an inverse filtration system that literally raises hot water into the T-Discs. This process will allow all of the coffee grounds to be easily soaked each time, without any pressure mechanism. The machine also has a flow-through heating technology and a water filtration system that provides a brewing system that is quick yet still produces perfect beverages at just the right temperature with each and every use. The water filtration system allows for a better tasting beverage. The machine comes with two cartridges and a built-in warning system that alerts when it is time to change the filter. The Tassimo is also very versatile for the user in that it has an adjustable and removable cup stand. The machine will fit most cups and mugs, including the travel kinds. Since the actual brewing process takes place in the T-Discs, it is simple to make successive drinks without losing flavor from one cup to the next. Stylish and simple, the machine was also created to save counter space and comes with a store area for the cord as well as a space for the T-Discs. The machine parts are removable and dishwasher safe. The machine parts that must be manually cleaned are accompanied by a cleaning and descaling program, helping to keep the machine low maintenance for any user. The machine is also energy-conscious as it goes into stand-by mode after each use. 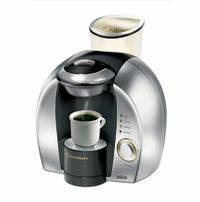 Thanks for the help I love this monitor easy-to-use single cup coffee maker.